Do you currently use Applicant Tracking software? Introduction: What is Applicant Tracking Software? Applicant tracking software is a centralized tool for managing the candidate sourcing, evaluation, and hiring process from start to finish. Common features include job board posting, career sites, interview tools, and analytics. A company’s recruiting efforts should be as efficient and effective as possible— especially when just one job posting can generate hundreds of resumes. As a company grows, applicant tracking software is necessary to automate and optimize routine aspects of hiring and free HR managers to find the best person for the job. The demand for hiring software is steadily growing. According to Bersin by Deloitte, HR research specialists, more than 60 percent of all companies have some type of applicant tracking system (ATS) in place. Talent acquisition makes up a $120+ billion worldwide market and boasts over 400 competitive solutions for hiring. The ATS market alone is expected to show growth of over 11 percent through 2018. Companies spend over $3,500 on the average hire, so the cost of hiring the wrong person is higher than ever. Which Applicant Tracking system is right for your business? An ATS is the company’s digital hub for hiring. It allows an organization to centralize their recruitment database by housing all information on candidates, job openings, and placements. Most applicant tracking systems include a website where candidates can complete customizable online applications. Once forms are completed, resumes are automatically parsed and screened according to previously determined keywords. Then qualified applicants are saved in the database for future reference. Career site: a brandable portal featuring job openings, customized input forms, pre-screening questions, and automated resume screening, ranking, and e-mail notifications. A good ATS also includes an internal portal where employees can view job postings, apply, or refer outside candidates. 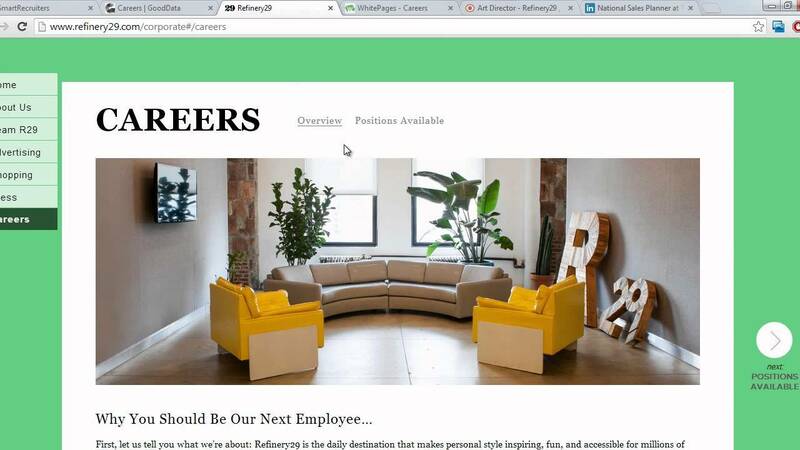 *Example of a custom careers site, hosted by SmartRecruiters. 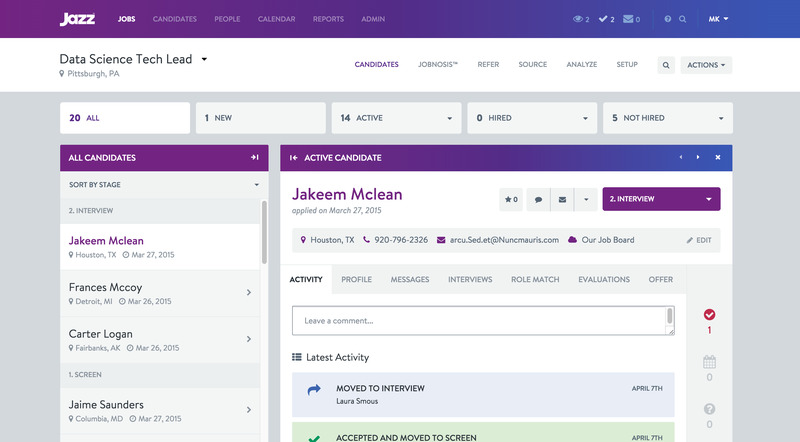 Advanced search: powerful search and sorting features allow recruiters to quickly search for candidates with specific keywords, phrases, and skills or experience. Applicant tracking: this includes the ability to upload files, documents, and additional information to a candidate’s CV. Assessment tools and reference checking are important components of this function, and some vendors may refer to the overall aspect of organizing applicant communications as “candidate relationship management”. Interview tools: along with automatic interview scheduling, video interviewing is becoming increasingly popular. Analytics: a paperless recruiting process allows you gather, store, and generate reports to help you pinpoint bottlenecks in your hiring process. 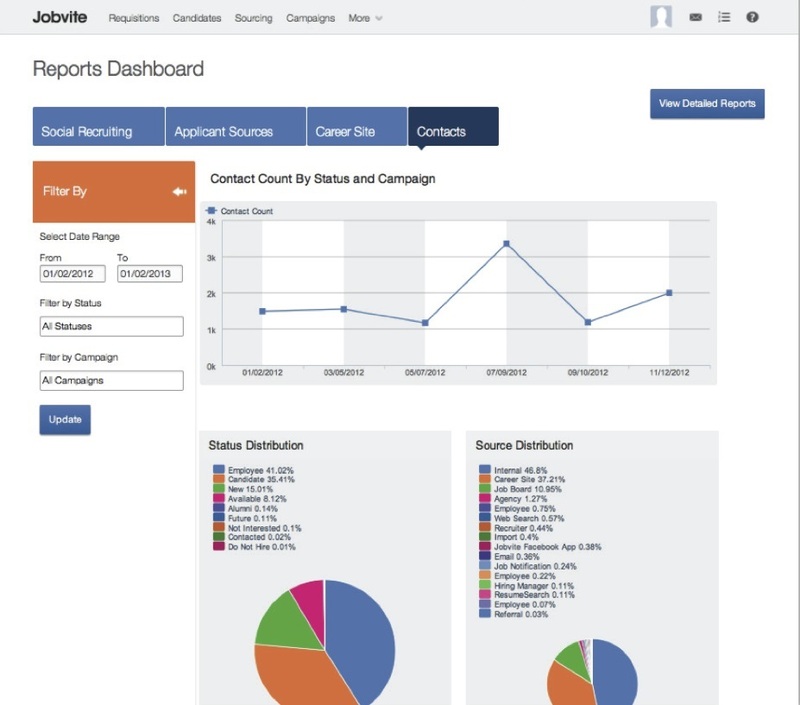 You can track your social sourcing efforts, career site engagement, and even manage advertising campaigns. In addition to these basic features, additional functionality and workflow customization— such as website integrations, job board postings, document collaboration, event management, rules and permissions, and integrated marketing automation — will vary from system to system. Some vendors will include them as standard features, while others may be purchased as add-ons. The overwhelming amount of features and ATS options available, coupled with the various monikers they go by — hiring software, human capital management, talent lifecycle management, recruiting software — makes performing an applicant tracking system comparison simple. An ATS is a major component of recruiting software, though recruiting software is generally much more powerful. Applicant tracking systems started as a way to scan paper resumes into a database. The technology evolved to filter, manage, and analyze candidates in the hiring workflow. Now, nearly every HR software company sells one. In addition to applicant tracking, recruiting software often equips users with task management and social recruiting tools, as well as modules for PR, CRM, billing, and a portal for clients. Compared to an ATS, recruitment software is considered a complete solution for an organization’s hiring process. However, the market is changing rapidly and talent management software is at a crossroads. The line between systems is blurring as vendors constantly release new features to differentiate themselves in a crowded market. Unfortunately, these “next generation” features swiftly become standard, and buyers are left with no obvious way to discern between systems. Additionally, this constant market transformation creates a confusing lexicon with little standardization amongst providers. For example, you will find some vendors strictly call their solution an ATS, though it could be considered recruiting software since it covers sourcing, tracking, onboarding, and analytics. On the other hand, many vendors market their solution as recruiting software, even though many are suitable as an in-house ATS. There’s no denying that talent acquisition is a critical and strategic HR function. So while the market fights to come to terms, our advice to you is: don’t get caught up on how vendors label themselves. Keep your focus on the goals of your business— learn what you want your system to do for you. What problem are you trying to solve? Where can you streamline and automate your hiring process? What is your old software missing? Answering these questions will determine the features you need from a new system, which means you get the best software for your business— whether it’s called ATS, workforce recruiting, or magic hiring pixie dust. Can you tell if your candidates are qualified or just selling themselves? With online tests, you can validate skills and ensure your candidate is a good fit from the start. In addition to recruiting internationally and easing scheduling conflicts, video meetings and interviews guarantee authenticity and standardization in the selection process. 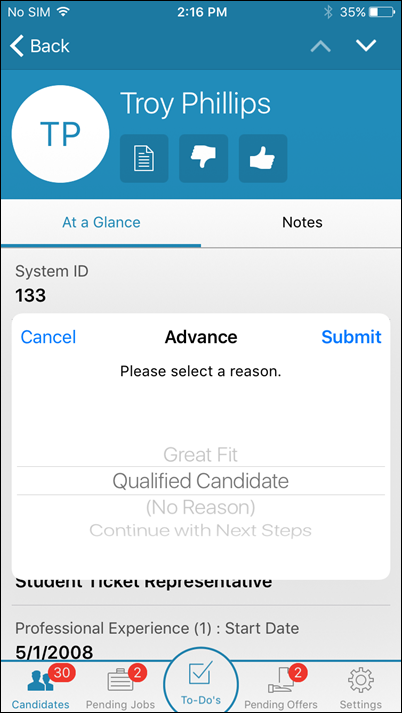 All qualified candidates will undergo the same exact interview process and hiring groups can independently evaluate each candidate. Social recruiting can leverage data in social networks, and use personalized messaging, gamification and automation to target candidates. Recruiting is moving beyond job board postings and employers must develop a talent network comprised of fans, candidates, employees, alumni, and even customers. These connections can be used to gain referrals and find talent faster. Mobile recruiting is on fire. The majority of Americans have a smartphone within reach 24/7, so mobile optimized career pages allow candidates to apply faster and even interview right from their phone. Additionally, hiring managers can move away from desktops and laptops and recruit on tablets, phones, and other devices. Modern web-based software deployments make hiring anytime and anywhere possible. An applicant tracking system is no longer simply a repository for resumes. Now that the entire hiring process has gone digital, companies know they can use recruiting data and analytics to optimize their process. Recruiters can predict which candidates are likely a fit, and analyze inbound/outbound marketing programs, user experience, mobile apps, and social media usage. And since the hiring process transitions into onboarding and talent management, more and more companies are seeking an all-in-one system that handles other HR processes in addition to applicant track functionality. Vendors that offer a full HR suite can help eliminate duplicate data and inefficient workforce management across an organization. Enterprise: For large organizations, an applicant tracking system that integrates with existing HR or ERP systems is necessary. Highly complex global enterprises also need strong collaboration features to share applicant data and receive feedback from hiring managers. Large companies with legacy applications in desperate need of an upgrade should consider integrated suites from one vendor, or ensure a new ATS will integrate seamlessly with existing systems. Agency: For high-volume recruiting, staffing agencies need many of the same features as enterprises. But agencies need additional features to handle client needs, such as customer relationship management (CRM) functionality. Agencies should consider industry specific recruiting software, but also keep in mind that the ATS market is swiftly evolving to meet their specific needs, so the label is less important than the functionality. SMB: Thanks to SaaS deployments, small-to-medium sized businesses can get the benefits of an enterprise ATS in a simpler and more economical format. SMBs should put scalability near the top of their features requirements list. Oftentimes, businesses with no HR department use a free applicant tracking system with limited functionality. This can be a great option starting out, but growing companies will eventually need a paid solution to handle more positions, users, and tech support. As an SMB scales, it can be tempting to upgrade with a vendor in order to circumvent data transfer to another system. But it may not be the top option. You’ll need to evaluate your company’s goals and growth projections to see if the vendor will continue to be a good fit moving forward. Creating executive buy-in is one of the most challenging portions of the software adoption process. To overcome this obstacle, you’ll need to build a compelling proposal that addresses how individual departments will benefit from the new ATS, as well as the company as a whole. Executives invest in solutions that save or help make money, avoid risk, or serve long term strategic purposes. To ensure successful adoption and long-term ROI, you must appeal to the differing pain points of your C-level audience so they see the need for an ATS. Applicant tracking systems streamline administrative tasks, simplify the hiring process, and create one central location for all your workforce data. But to create a common language and shared perspective, you’ll need to connect the dots for other decision makers. You should speak their language and use data to back up your proposal. Below are a few ways to align your initiative. CTO/CIO: Talking to your technology leadership before a project starts may feel like overkill, but it’s important to involve them in new requests as early as possible. Your company’s IT department is constantly aligning company goals and infrastructure, security, downtime, data back-up, and so on. Their purpose is to help your business function efficiently and stay agile and competitive in the market. Seeking their advice early and often will help minimize implementation issues later. CIOs can help ensure that an ATS aligns with the company’s growth and 3-5 year technology life-cycle plan. They’ll likely be interested in solutions that reduce infrastructure requirements, updates, and support. and as well as the potential to reduce their needs for internal infrastructure. They’ll eventually manage your ATS anyway, so make the IT department your ally upfront. When HR and IT can stand together behind a new proposal, you’ll have a better chance of buy-in from other execs. CEO: Your CEO is concerned about the big picture— not the specific functionality an ATS offers. Talent and leadership shortages are a huge business challenge: 63 percent of CEOs are concerned about the availability of key skills, and 50 percent of CEOs plan to increase headcount over the next 12 months. HR technology can alleviate these concerns. With data analytics, HR departments can provide applicant conversion rates, how long it takes to review resumes, or other key metrics at a glance, as well as predict what skills will be needed, then plan for those changes. Time saved by automating hiring tasks can then be used to focus on improving strategic initiatives that attract and retain talent. In short, you’ll need to know the potential ROI and prove that a modern system will allow you to continually measure new hire quality and use that information to fine-tune the recruiting process. Remember, focus entirely on your decision makers and what’s in it for them? For decades, the hospitals of Allegheny Health Network have provided exceptional healthcare to patients. AHN is comprised of seven hospitals, more than 200 primary and specialty-care practices, 2,100 physicians, 17,000 employees, and 2,000 volunteers. The company’s “post and pray” strategy and outdated ATS severely limited reach and growth possibilities. Additionally, with highly diverse talent requirements to meet, AHN’s sourcing and recruiting model needed a total overhaul. AHN implemented Jobvite to streamline their entire hiring process. Reporting capabilities allowed the AHN team to better understand the job seekers path to hire, create an easy application process, and pinpoint effective sources of talent. Ready to find the best applicant tracking software for your business? That’s where we come in. From guides, to reviews, to side by side system comparisons, product information, and research articles— we’ve done the hard work for you. If you need guidance choosing a solution, free personalized product recommendations are available by phone or online via our Product Selection Tool.